“Swirling Mandala [Cataclysm]” is part of a series of mandala like forms which stretches back to the early stages of my career. The early forms were geometric, hard edged in feel. They have changed/evolved to the current organic/ fluid-like forms. I have said on a number of occasions that “I have added one or two drops of Post Modernism to the mix”. I like this notion, of integrating various ways of looking at the world into a changing evolving whole. In this work, notions of change/fluidity sit with timeless concepts, apparent opposites co-exist. This is a major theme throughout my work. 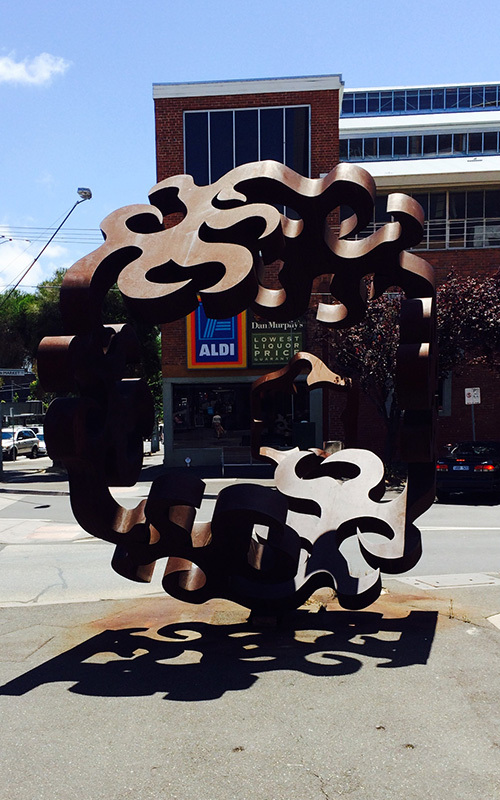 “Swirling Mandala” is also a large public sculpture. At four metres high, consideration of scale to the site has been given, an important factor in placing sculpture in the public arena. 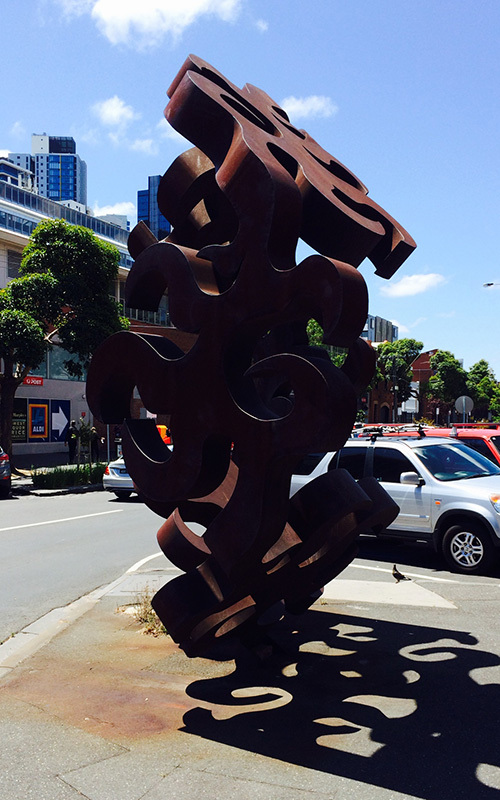 The sculpture is made from Corten steel, which ages to many of the colours we see in our landscape, as such I believe it is a material well suited to Australia. It also has a softness and a colour contrast to our city landscapes which introduces a sense of the organic to our often rigid inner city environments. “Swirling Mandala” has a strong reference to fire, to the fire which still plays a role in forming our landscape and is a quintessential image in our national psyche. I have been attempting since 1990 to make sculpture which both comes out of “this place”. This includes influences from European culture, which has so dramatically impacted on Australia since European arrival. As such, there is also a reference in this sculpture to the turbulent drawings of cataclysmic forms and forces which Leonardo da Vinci drew [“Cataclysm”]. “Pattern–Wavering” continues a series first begun in the seventies, which has become over the last decade far more organic/flowing in feel. I feel this work will work well as a counterpoint to “Swirling Mandala[ Cataclysm],” installed further down the road. “Pattern-Wavering” is gentler in feel, a flower like motif appears in the centre which contrasts with the fire like image in the centre of “Swirling Mandala[Cataclysm]”. I believe the two sculptures together should engage the public in an interesting/contemplative experience as the walk or drive past them. The two pieces also change dramatically in a visual manner which should further engage the public.